Tuesday August 29, 2017: Eric chooses a side between Quinn and Sheila, CJ has more bad news for Sally, and Justin cautions Bill. In the bedroom at the Forrester mansion, Quinn dares Sheila to choke her out and show Eric how crazy she really is. Sheila strangles her a bit and then leaves Quinn sputtering that she almost killed her, and vowing she’ll be out of the house tonight. Sheila takes off with Quinn on her tail to find Eric. In the living room, Eric’s dismayed to realize they squared off again. Quinn seethes that Sheila is a menace and she wants her out of the house. She describes the scene upstairs from beginning to end as Sheila accuses her of over-dramatizing. Eric asks if Sheila’s been exaggerating her symptoms. Sheila denies it and reveals she’s worried about Quinn betraying him again. Eric sides with Quinn and informs Sheila she’s out. Sheila stares at Quinn’s portrait before exiting. After, Eric soothes Quinn with a hug. Outside, Sheila vows she’ll be back…and it will be her portrait hanging over the fireplace. 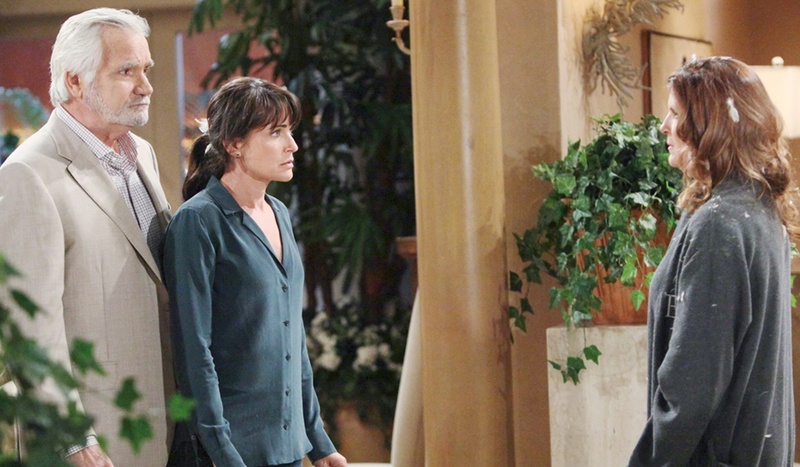 At Forrester Creations, Steffy senses Liam is troubled. He lets loose about how much it’s bothering him to keep Bill’s lie. Pam bursts in and announces there was a fire at Spectra Fashions. Liam and Steffy take off. Sally coughs behind an oxygen mask in the hospital as her staff, Coco, and RJ look on. The doctor diagnoses minor smoke inhalation. Sally murmurs that her entire future went up in flames. Liam and Steffy show up. Sally says everything’s gone – designs…dreams. The duo is so sorry. CJ arrives, emotional and relieved that everyone’s alive after seeing the remains of the building. He reports the Fire Marshall said the fire was electrical. Sally concedes they couldn’t afford to fix it, but assures everyone they’ll rebuild with the insurance money. CJ admits he let the insurance lapse. He shrugs that maybe Bill Spencer will buy what’s left. Liam suddenly has to go. After, Steffy and Sally speak alone. Steffy can’t imagine what she’s going through. Sally admits there’s no coming back from this – Spectra Fashions really is dead this time. Ridge offers an opinion on Sheila.